Author Randy Alcorn explores how he wrote the contemporary novel “Courageous” (adapted from the new film), and how anticipating the physical New Heavens and New Earth can change a Christian’s life forever, starting now. 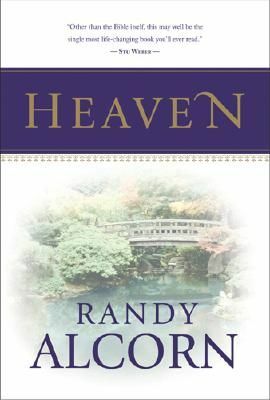 A popular pastor and author, Randy Alcorn has given Christians many works of nonfiction on topics ranging from life issues, birth control, stewardship, and especially living in light of eternity. Yet he has also penned bestselling fiction like Dominion, Deadline, and the award-winning Safely Home. Now in this second of a two-part series (read part 1), Alcorn shares his thoughts on the power of story, Christians’ responses to speculative genres, writing Courageous for the new film, and the prophesied New Heavens and New Earth. How did you write the novelization for the film Courageous? 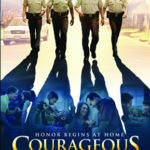 Last year I said yes to writing a novel based on the screenplay of the new movie Courageous (www.courageousthemovie.com), which is being released in theaters on September 30. The movie was done by the Kendrick brothers, Stephen and Alex, who produced Facing the Giants and Fireproof. As Fireproof centered on fire fighters and marriage, Courageous centers on police officers and fatherhood and, not surprisingly, COURAGE for men in their homes and personal lives. Some movie screenplays are based on novels, others are written directly for the movie. In those cases, a novelist, such as myself, is called in to do a “novelization” of the screenplay. The fun thing about this project for me was that the excellent spine of the novel Courageous already existed in the screenplay, but the novel is about five times longer, meaning that I had to invent 80% of the story line. This was an imaginative process for me, because I introduced new characters and locations and many scenes that are not in the movie. 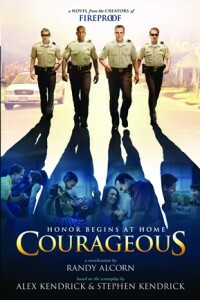 Many who watch the movie Courageous will want to learn more about the story than is in its two hours on screen. The novel is the equivalent of ten hours of screen time, and allows much more exploration of the characters, back-story and subplots as well as new dramatic scenes (without having to spend millions of dollars to produce them). When I tell people I wrote a novel based on the movie, they are excited and ask all kinds of questions. They love the idea of seeing the movie, then exploring it in the novel form, in characters and storyline and themes in greater detail at their leisure. Movie-making and book-writing are not contradictory, but supplementary mediums. Watching Alex and Stephen sit at their computers surrounded by big screens, editing Courageous, showed me that making a good movie is remarkably similar to making a good book, which I’ve been trying to do for twenty-five years. The painstaking editing process helps you to make it into the most compelling story that reaches into the audience’s hearts. What makes a story unforgettable and haunting is the same thing in movies as it is in books. We crave a story that has the ring of truth, and involves action and conflict and the growth of characters we care about. We want a story that we don’t leave behind when we leave the theatre or read the last page of the book. We want a redemptive story that stays with us and changes us for the better. That’s what I’m convinced the movie Courageous will do. My prayer is that the novel Courageous will do the same. How does anticipating the New Earth change our lives? Without an eternal perspective, without understanding the reality that the best is yet to come, we assume that people who die young, who are handicapped, who aren’t healthy, who don’t get married, or who don’t _____ [fill in the blank] will inevitably miss out on the best life has to offer. But the theology underlying those assumptions is fatally flawed. We’re presuming that our present Earth, bodies, culture, relationships, and lives are superior to those of the New Earth. What are we thinking? I believe the New Earth will offer us opportunities we wished for but never had. God’s original plan was that human beings would live happy and fulfilling lives on Earth. If our current lives are our only chances at that, God’s plan has been thwarted. Consider the injustice—many honest, faithful people never got to live fulfilling lives, while some dishonest and unfaithful people seemed to fare much better. But God is not unjust, and this is not our only chance at life on Earth. The doctrine of the New Earth clearly demonstrates that. 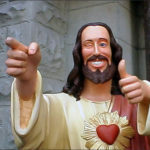 Jesus tells the hungry they’ll be satisfied. Those whose eyes are swollen with tears will laugh. Those persecuted should leap for joy now. Why? Because of their great reward in Heaven later. Where will Heaven be? In the parallel passage Jesus says, “Blessed are the poor in spirit, for theirs is the kingdom of heaven. Blessed are those who mourn, for they will be comforted. 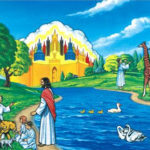 Blessed are the meek, for they will inherit the earth” (Matthew 5:3-5). Earth is the setting for God’s ultimate comfort, for his reversal of life’s injustices and tragedies. We will live on what we inherit—the earth. All the blessings Jesus promised will be ours in the place we will live—the New Earth. God promises to make up for the heartbreaks of this earth. Are you living with the disappointment of unfulfilled dreams? In Heaven you’ll find their fulfillment! Did poverty, poor health, war, or lack of time prevent you from pursuing an adventure or dream? Did you never get to finish building that boat or painting that picture or writing that book—or reading that pile of books? Good news. On the New Earth you will have a second chance to do what you dreamed of doing—and far more besides. Living under the Curse means we miss countless opportunities. The reversing of the Curse, and the resurrection of our bodies and our Earth, mean we’ll regain lost opportunities and inherit many more besides. In this world, even under the Curse, human imagination and skill have produced some remarkable works. The statues of Easter Island. Stonehenge. Shakespeare’s plays. Beethoven’s Ninth Symphony. The Golden Gate Bridge. Baseball. Heart transplants. Prenatal surgery. Microwave ovens. DVDs. The space shuttle. Chocolate ice cream. Pecan pie. Sports cars. It’s a list that never ends. With the resources God will lavishly give us on the New Earth, what will we be able to accomplish together? When we think about this, we should be like children anticipating Christmas—sneaking out of bed to see what’s under the Christmas tree. Without creativity, music would be a dull succession of sounds. Without creativity, books would be colorless and superficial. They wouldn’t engage our minds and hearts. Paintings would be lifeless or nonexistent. Our homes would be barracks, our buildings boxes. God’s preparing a place for us, and he’ll equip us to develop it to his glory. On the New Earth, God’s gifts to us will never be lost to age, death, pettiness, insecurity, or laziness. Undistracted and undiminished by sin and the demands of survival, mankind will create and innovate at unprecedented levels, to God’s eternal glory. Before starting EPM in 1990, Randy served as a pastor for fourteen years. 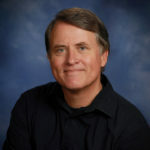 He holds degrees in theology and biblical studies, and has taught on the adjunct faculties of Multnomah University and Western Seminary in Portland, Oregon. Randy has written more than forty books including the best-sellers Heaven, The Treasure Principle, and the Gold Medallion winner Safely Home. Alcorn resides in Gresham, Oregon with his wife, Nanci. They have two married daughters and are the proud grandparents of four grandsons. Randy enjoys hanging out with his family, biking, tennis, research, and reading. You may contact Eternal Perspective Ministries at www.epm.org or 39085 Pioneer Blvd., Suite 206, Sandy, OR 97055 or 503.668.5200. Follow Randy on Facebook, Twitter, and on his blog. Giving people permission to fantasize about Heaven and the next world is like giving them permission to use their imaginations. It’s amazing how people refuse to use their imaginations for fear of being thought heretical. I see this a lot in the dinosaur-artist circles. Nobody dares dream fantastic things about dinosaurs and the pre-flood world because It’s Not Allowed by the Authorities. People like Bob Bakker, who dare say that maybe dinosaurs lived in different habitats, and maybe certain kinds hunted in packs, are shunned and looked at askance by their colleagues. Christians do the same thing, sadly. What, you’re writing a book with aliens in it? There are no aliens in the Bible! You’re either fallen away, worldly, or deceived by Satan. Hallo, Kessie! Glad you enjoyed the interview. I might highly recommend, also, that you check out Alcorn’s nonfiction book Heaven, which is mostly about the New Earth and what Scripture does say about it. So In a sense, I suggest that we don’t even need to excuse “fantasizing” about the New Earth because what Scripture already tells us about it — but which we bypass in favor of “heavenly” notions — is already fantastic. I think that this results because people have already adopted what Alcorn calls “Christoplatonic” ideas about what Christians’ eternal home will be like. They assume that things like eating, drinking, not knowing things, and even the passage of time and physical matter itself, are somehow evil. 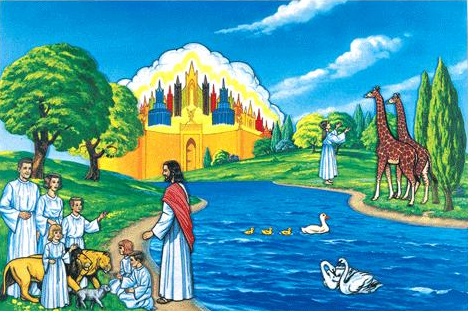 But they weren’t evil in the Garden of Eden before Adam and Eve sinned, and they aren’t evil now. I see this a lot in the dinosaur-artist circles. Nobody dares dream fantastic things about dinosaurs and the pre-flood world because It’s Not Allowed by the Authorities. People like Bob Bakker, who dare say that maybe dinosaurs lived in different habitats, and maybe certain kinds hunted in packs, are shunned and looked at askance by their colleagues. That is a circle about which I’m not very familiar. I’d be interested to hear more on this. By the way, I can recommend Douglas Hirt, author of The Cradleland Chronicles, as one example of someone who attempted Biblical fidelity while also being free to explore with imagination what the pre-Flood, intelligent world could’ve been like. Rebecca Miller has done some great work here, recently, about how fiction should be based on truth. I suggest it should be based on the most important truths. I would indeed call someone un-Biblical who wrote a novel with a Godlike character, who acted and spoke like the Biblical God, but who needed to be overthrown by humans. However, suggesting an alternate universe in which aliens did exist and either the Biblical God is simply “ignored,” or else decided to act differently in that way, in this imaginary world, but still maintain His attributes per Scripture’s unbreakable truths — that’s different! I also appreciate, in Heaven, Alcorn suggests that God may create new creatures, even on other planets, in the redeemed New-Earth universe. Scripture doesn’t say He will, but we do know about His character: He is a Creator. And we can ask: would He stop creating?